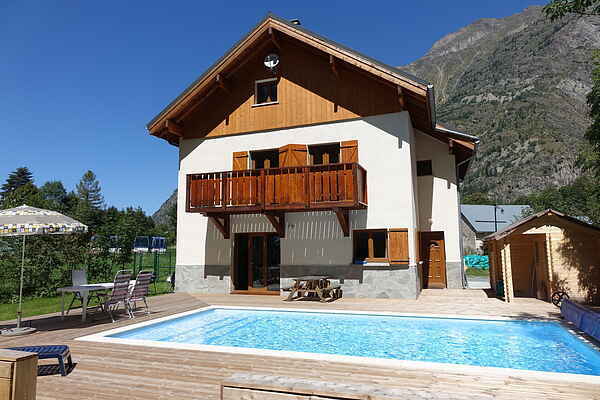 The detached chalet with swimming pool is located in the valley of Massif de l'Oisans, 9 km away from Bourg d'Oisans at the foot of the Alpe d'Huez. The chalet is suitable for groups of up to fourteen people. The outdoor swimming pool is heated to around 25 degrees and opened from mid-May. There is also a (heated) outdoor shower. The chalet features over six bedrooms and three bathrooms, a spacious living room, open plan kitchen, terrace and a large garden and its own parking. There is also a separate garage for the safe parking of bicycles and skis. You'll be staying in a beautiful location at the edge of one of the largest nature reserves in France, "Les Ecrins", close by Les Deux Alpes and Alpe d'Huez. This is a fantastic for lovers of high mountains. The chalet is located in the picturesque French mountain village of La Danchère. The gondola to Les Deux Alpes is 3 km away. The chalet is ideal for ski and cycling lovers in the area of Deux Alpes, Alpe d'Huez or Serre Chevalier. The outdoor sauna is extremely practical and has its own dressing room. The sauna's interior is consists of a low and and a high bench. The sauna is suitable for 4 people. This newly built (2013) chalet is very spacious for 14 people. The large living room, the terrace outside, the 6 spacious bedrooms with beds of 210 cm length and 3 bathrooms make it very pleasant to stay. The chalet is very well located for skiing in Les 2 Alpes, it is 3 km from the telecabine, and happily the road is always cleared of snow. Other nearby ski areas are of course Alpe d'Huez (15 min) and Serre Chevalier (60 min). Perfect for a day variety. The chalet is close to the Mecca of cycling and is located 9 km from the foot of the Alpe d'Huez, and close to cols as the Galibier, the Lautaret, the Croix de Fer. You can cycle yourself, or join one of the various cycling events organized in the region; think of La Marmotte, the Alpe d'HuZes and of course the Tour de France! For hikers and nature lovers among you, La Danchère located at the side of the Parc des Ecrins, where you can walk for days in one of the most scenic areas in the world. It is the second largest national park in France! Hence the beautiful views from the chalet, 360 °, all sides of nature! And the weather cooperates, more than 300 days of sunshine per year!